Goldman Sachs shares fell, plumbing new lows for 2018, as the money laundering probe involving Malaysia's state investment fund "1MDB" took a more serious turn for the firm on Monday. Malaysia filed criminal charges against Goldman Sachs and two employees, Tim Leissner and Roger Ng, in connection with the probe. Goldman raised $6.5 billion in 2012 and 2013 for the fund through three bond deals. In an emailed statement to Reuters, a Goldman spokesman said, "these charges are misdirected" and that the bank continues to cooperate with all authorities. 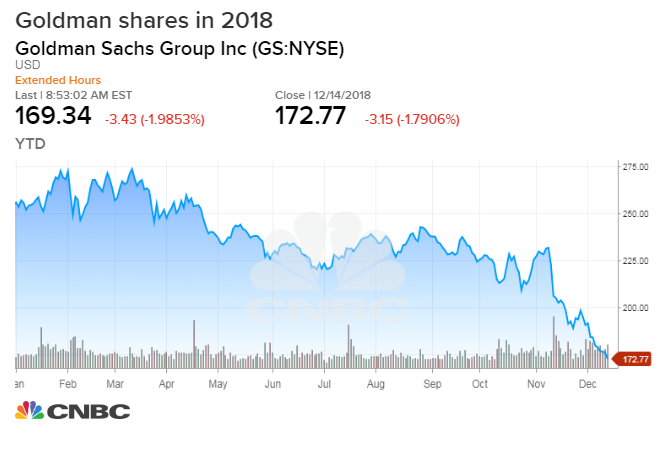 Goldman Sachs shares have collapsed this quarter on developments with the probe and are now down 34 percent this year. With Monday's decline of 2.4 percent at 9:34 a.m., those losses were set to mount. The drop in the stock accelerated in early November after Malaysia's finance minister said he would seek a full refund on the $600 million in fees the country paid the bank for arranging the bond deals. Goldman also faces possible fines from a U.S. Department of Justice investigation into its role in the 1MDB scandal. Former Goldman CEO Lloyd Blankfein attended a 2009 meeting with Malaysian financier Low Taek Jho and an associate, who are accused with laundering billions of dollars from the fund, according to a person with knowledge of the situation. Low has said he is innocent. — CNBC's Hugh Son and Reuters contributed to this story.